Pay Scale : 42020- 51490. Age as on 01.04.2016 : 25-35 years. Pay Scale : 31705-45950. Age as on 01.04.2016 : 23-35 years. Pay Scale : 23700-42020. Age as on 01.04.2016 : 21-35 years. Age relaxation : 5 years for Scheduled Caste/Scheduled Tribe, 3 years for Other Backward Classes, 10 years for Persons With Disability and 5 years for Persons affected by 1984 riots. Selection Procedure : Interview of 50 marks + Group Discussion + Identity Verification. For SC/ST 50/- and 500/-rupees for all others. 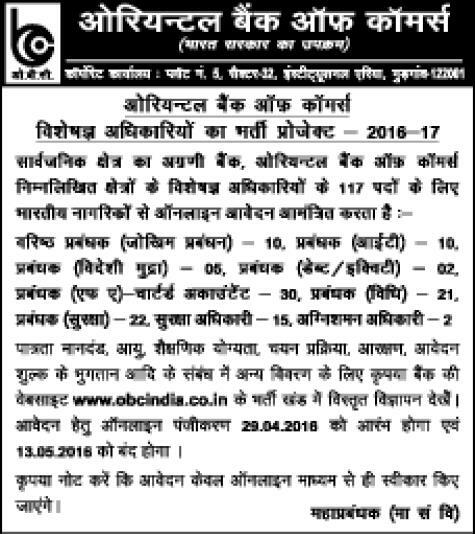 Apply online at OBC website. Payment of application fee : Through online mode.